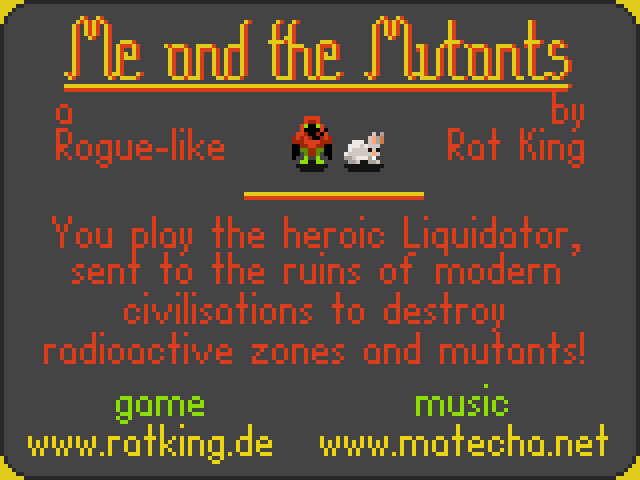 Before we began to create "Me Against The Mutants" we had other ideas for our 7-Day-Roguelike Challenge entry. 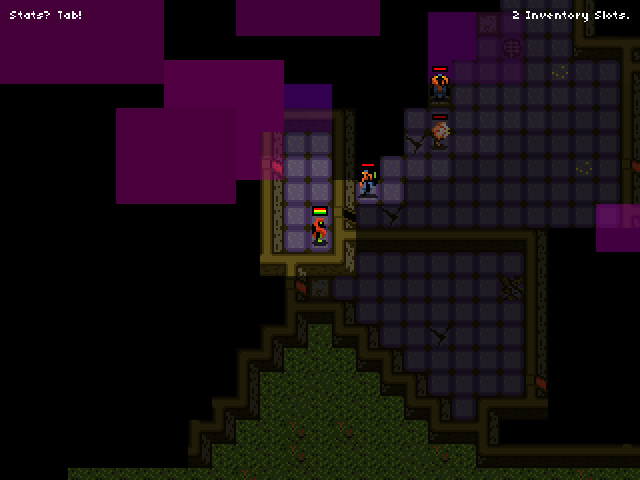 All a roguelike needs is a turnbased gameplay with a walking player and some enemies – and then you add things. Things like different zones, the ability to break walls, end-bosses, etc. So our first real idea was about a prince who has to be protected by several amazons. You would play the whole group, and while amazons are good at fighting, collecting items and other stuff, the prince would be a whiny weakling with no skills at all. But as soon as he dies your mission fails, so you'd have to use the amazons as his wardens. We liked this idea very much, but unfortunately it transformed into a full 7-day-roguelike and even beyond, and we had to plan for something with a much smaller scope. We knew we wouldn't have much time during that week, so after some rethinking we scratched the concept and went for a simpler approach: the player is in a world full of radioactively contamined mutants and has to use "infinity fields" in order to reach places and get rid of enemies. Why was that easier? Because it means focusing on a single gameplay mechanic (the infinity), which we invented a year or two ago but never used it for anything. This way, we could concentrate on the basic mechanic of roguelikes not just by making a simple clone, but rather by adding something new to the genre which hopefully doesn't need so much work. Of course, it was much work and there still were problems. No matter how small the focus of a game is, the whole thing at least needs some time to become an actual game. However, the technical hurdles of "Me Against The Mutants" were bigger than anticipated. 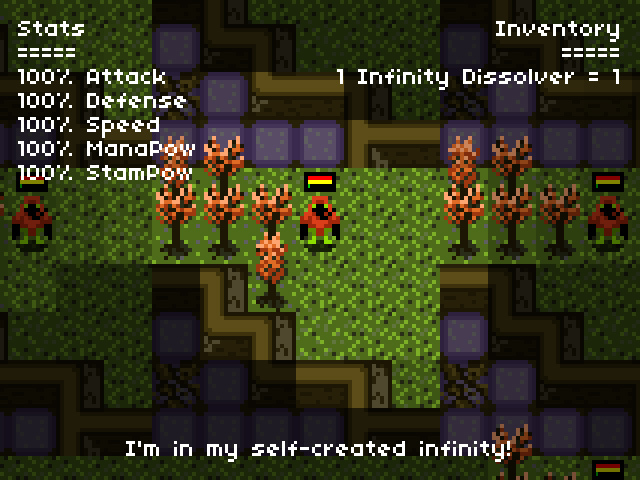 Even though I already tried the infinity mechanics via smaller prototypes, I never implemented it with entities other than the player. When all the tile-based movement of the player finally functioned inside an infinity zone, it became clear that the current implementation would not work with the enemies. A big modification of the code was necessary, and for some hours I even lost all hope to get it to work again as error followed error every time I tried to compile the project. In the end the whole thing was worth it, although it cost me a whole day – not only the player could create infinities and enter them now, but also the world and its inhabitants were able to do so. Thus the idea of the radioactive zones was born, and now the player had to be careful not to walk into a "natural" infinity field unprepared. One decision we reached very early was to make the game realtime instead of turnbased, i.e. NPCs and monsters can move and act all the time. We are still not entirely sure if this was a good decision (as it is a downer for many fans of roguelikes), but somehow it makes the game more dangerous and it complements the infinity fields. As "Me Against The Mutants" is very small in focus, there is not much variety; in my opinion realtime helps to tighten the gameplay in this case. Would it have been turnbased, people would get bored of the pretty obvious AI very fast. For instance, a varying speed of the player isn't much of an issue for the gameplay – even though having different speed for every character was one of the reasons we wanted to have realtime gameplay! It's also essential that the self-created infinity fields don't exist forever, so a tactical course of action is desirable; but I was never quite content with the approach of using mana. If it drains too fast, the infinity isn't much fun; but when it drains too slow, it doesn't make much sense in the first place. Either way, automatic mana regaining was needed – which made the mana refill containers I placed in the world useless in the end. The differently coloured slimes are another part of the balancing act. As the game has no concept of the player's progression level (it is far too short for that), we invented another way of changing the player's various skills: slimes. In the beginning, when we thought we could add much more things to the game, the slimes would be large radioactive pools and change everybody around them. They would have been the real reason for normal creatures suddenly being mutants. As we never really had a plan how exactly that would happen and also not the time for elaborate mutations, the slimes became the simple, but double-edged swords they are now. 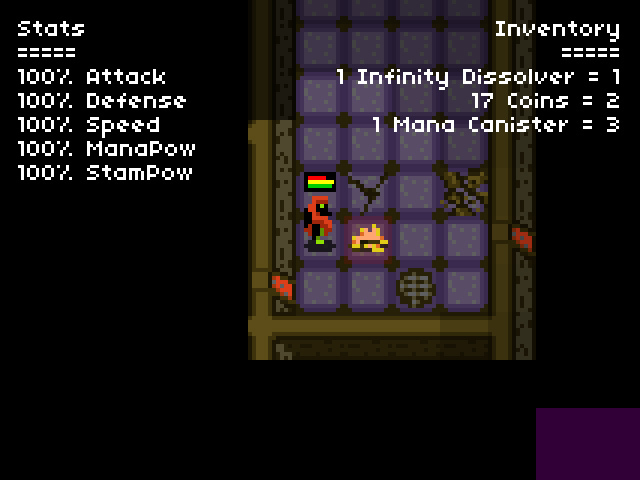 They can boost the player or make him weaker or both – the effects are random, but don't change per colour, so every red slime in the world does the same. Of course, sometimes the God Of Randomness decides that every slime colour has to have mostly negative effects, so this gameplay mechanic really could benefit from a little bit more thinking. The slimes are also one of the reasons why there are bunnies outside the contamined building. The little rabbits were planned as creatures not yet mutated but with the possibility to do so. As the game progressed only slowly over the week, it was clear that they would regress to decoration. But they also serve as a tutorial – the player can approach the bunnies, hit them and even backstab them without having to fear them to counteract. In fact, the whole outer region, the grassland with the forests, was planned to be a dangerous zone but instead it is now an interesting contrast to the mutant-infested building. Somehow, it promises some kind of peace and happiness this way. On the other hand, our roguelike is missing handholding at the beginning, and some people were really not sure what the game was about and how to control it. Sure, they could have read the instructions at the start of the game or below the embedded SWF, but never one never should expect something like this. Nonetheless we like that the game is even more about exploration this way, and the first "Aha!" moment when you get into the building is really fulfilling. About the graphics: pixel art was an unconquered field for us. We mostly dabble in the third dimension, so concentrating on single dots instead of polygons was a small challenge for Jana's skills as an artist. Nonetheless we were eager to try it, and it also convinced us to make a full game with pixel graphics some day, as they are neat and have an abstract style which can make forget the lack of detail. And even though retro pixel graphics already are widely used in the indie gamedev scene, the pure form of the pixel still can produce novel looks and an interesting atmosphere. Confused how to play this. You mention mushrooms, but I cannot find any and I keep running out of health eventually.